As South Korean state oppression increases in light of the IUCN (International Union for the Conservation of Nature) 2012 WCC (World Conservation Congress), with three Okinawans, one Japanese, denied entry on September 5th, and the entry denial of Imok Cha on September 3rd, Gangjeong villagers and activists are not giving into fear of unjust government attacks, something they have dealt with for 5 years. On September 6th, the opening day of the 2012 WCC in Jeju, 5 anti-base activists climbed a 10 meter high, 8,800 ton caisson in Hwasoon Port, about a 40 minute car ride from Gangjeong village. Samsung is making these massive concrete caissons there and shipping them to Gangjeong, where they plan to use them to build the huge piers of the naval base. Many villagers, religious figures, and peace activists have been injured, arrested, and imprisoned to stop this naval base construction (destruction) in the village. Even though our power might be small, we will fight with all our strength against this enormous dominating power, symbolized by this caisson. The action began around dawn, with the 5 protestors scaling the caisson and displaying three large banners, two in Korean, on in English which said, “No! Naval Base in Jeju!” At approximately 7:30 a.m., construction workers violently assaulted the occupiers and began destroying the banners. The police began arresting the protestors by 8:30 a.m. 3 were arrested first as two of the protestors had chained themselves. Finally by 9 a.m. all were arrested and are, as of this posting, in police custody in the Seogwipo police station. Two of them are complaining of strong back pain as a result of assault by the workers. As of this time, the charges appear to be “Group Trespass of a Facility”. The aforementioned caissons are a subject of major contention by the anti-base activists and Gangjeong villagers. In the late 90s, years before the Jeju Naval base construction was even begun, the South Korean Ministry of Construction and Traffic declared that, due to the topography and weather of the South Jeju Sea, caissons were not proper to be used for construction in this area. Completely ignoring this statement, the Navy/Construction company plan calls for total of 144 caissons to be dropped in the total conservation area of the Gangjeong Sea of Southern Jeju. These massive caissons are also being dropped only 1km from a UNESCO World Natural Heritage Site and amidst Korean some of the worlds largest soft coral habitats. Soft coral is also a natural monument and endangered species in Korean. 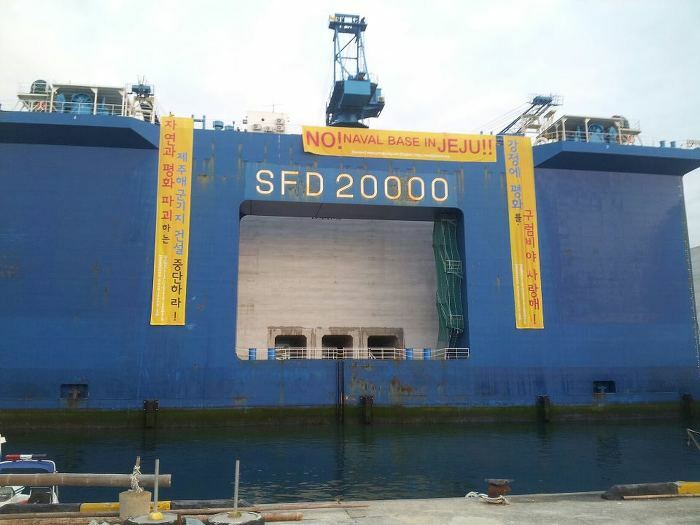 When Samsung first began to bring the caisson to Gangjeong, it was discovered that they had not even done a simple and legally required inspection of the giant floating dock which is used to transport them. Samsung was later fined for this highly dangerous action. Finally, two recent typhoons have been completely destroyed the 7 poorly made and dangerously placed thus far in the Gangjeong Sea. Their wreckage has litered the sea floor and contaminated the famously clean waters of Gangjeong. Learning nothing from this, Samsung continues to produce the caisson and will not change their plan. The Gangjeong sea is in a state of environmental emergency and if these unstable, unfit, and dangerous caissons continue to be dropped in this precious environment, the destruction could turn catastrophic. 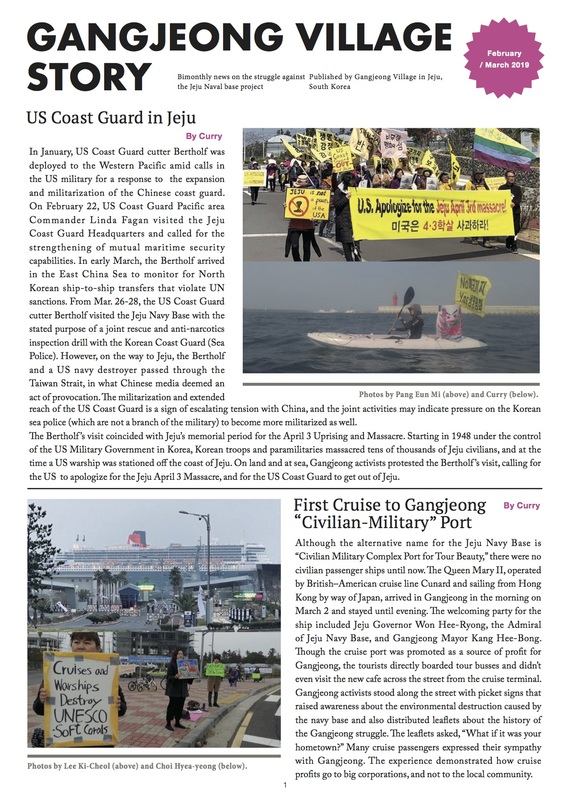 In light of this new emergency, and the ongoing emergency of the illegal, unjust, and environmental destructive construction of the Jeju Naval Base in Gangjeong, the Gangjeong Village Association applied for a booth at the WCC 2012, to spread the word of this disaster. However, this booth was rejected by the IUCN under pressure from the South Korean Government and Samsung, a major sponsor of the WCC and primary destroyer of Gangjeong. Please spread the word on this action and the Gangjeong Struggle. Especially, IUCN members, we appeal to you to listen to the cry of Gangjeong! Peace in Gangjeong! No Naval Base! 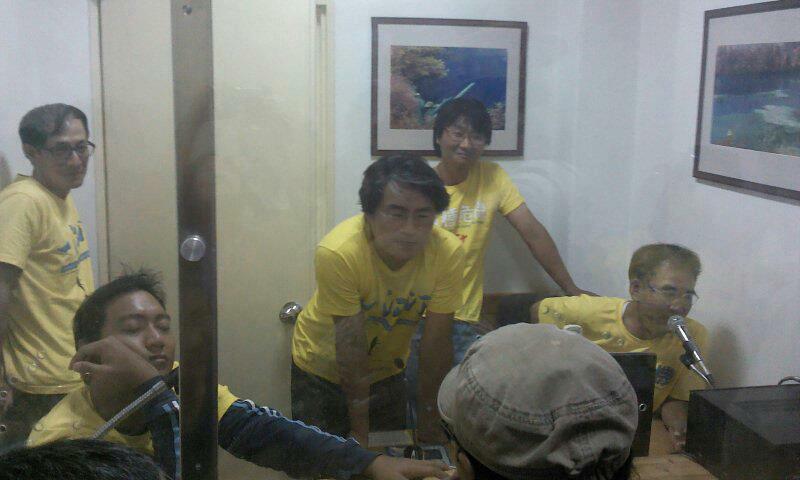 The five caisson occupiers in police custody at the Dongbu Police Station in Jeju City.